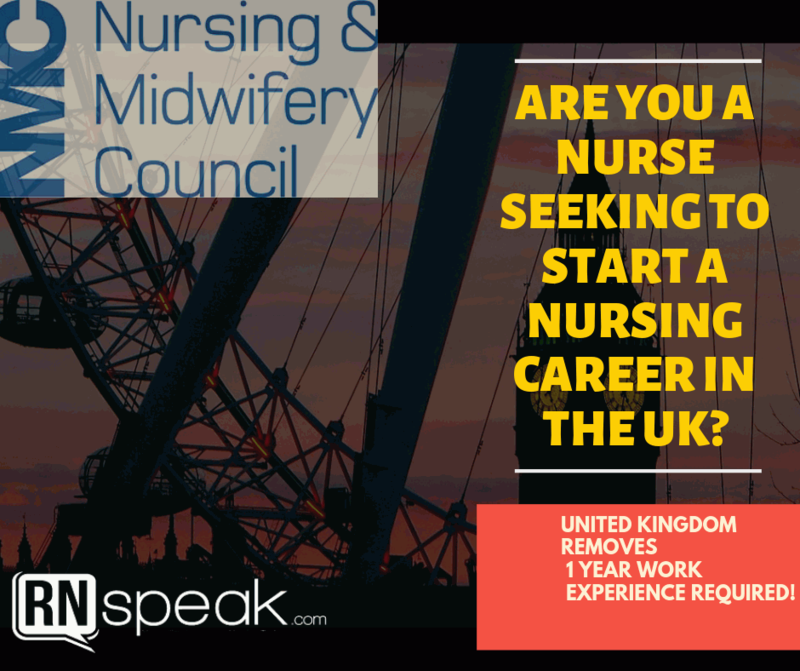 Are you a Nurse seeking to start a Nursing Career in the UK? – United Kingdom removes 1 year Required Work Experience! Overseas nurses are now able to work for the UK without having to run through all the tedious work. Any registered nurse wanting to work in the UK must abide by the procedures required by the Nursing and Midwifery Council (NMC). However, this year, NMC have removed one part of the process which makes it a lot faster to apply as a nurse in the UK. For instance, NMC has introduced improved guidance and has given supporting materials for applicants so that they can prepare as intensively as possible to meet the NMC requirements. More than 65,000 nurses and midwives from outside the EU deliver first class care to millions of people across the UK every year and they are a vital part of our health and care workforce. A spike in the number of overseas nurses from outside EU joining the UK register have been noted by the NMC. The latest data presented by the NMC was an increase in 86% of nurses and midwives joining the UK registry just last July. An average of 440 applicants each month have joined UK registry compared to the 237 applicants for the previous months. Since October 2014 until recently, the only way to work for UK is through NMC’s 2-part application process. The application for nursing (or midwifery) is £140. Part one involves a computer based multiple choice examination which is accessible to many parts of the world for foreign applicants. This costs £130. Part two is a practical objective structured clinical examination (OSCE) which is always held at UK. This costs £992. An additional of £153 is for the admission into NMC’s register. A total of £1415 must be prepared for applying. These tests of competence requires extensive preparation, hardwork and study to make sure one is equipped with the right knowledge, understanding and application of skills at the right level. All nurses are expected to be able show competency and professionalism when responding to the needs of their patient. Example: A children’s nurse must also be able to cater the needs of a pregnant woman or someone who has physical disabilities. A children’s nurse must be able to be versatile and competent when it comes to work. Example: An ICU nurse must also be able to show care and respond to the needs of a patient with dementia or someone who needs help with mental health needs. An ICU nurse must be useful even outside the ICU and be available in times of need. Once the application is eligible, they will now be asked to take the test of competence. As mentioned above, the first test (CBT), is a multiple choice examination and can be taken anywhere in the world. Applicants will need to contact Pearson VUE, the test provider, in order to book and pay for the said examination. For more information on the first part, please visit this link: https://www.nmc.org.uk/globalassets/sitedocuments/registration/candidate-information-guide-toc-part-1-pearson-vue.pdf. Applicants take the first part in the competence test which is CBT and can take this twice as part of one application, but has to wait 28 working days in between retakes. If the applicant is still unsuccessful on their second take, their application will be closed and will be required to wait for another six months before being eligible for another registration again. For applicants who passed the CBT, they must then proceed to the second part, which is the OSCE. An applicant can retake OSCE up to three times in one application. If he/she fails the first OSCE, they must wait for 10 working days in order to retake the test. If he/she still fails on the second try, they must wait for a minimum of three months from the date of their second exam. If by the third take, he/she still fails the OSCE, their application will close. The applicant must wait for a minimum of six months before taking the OSCE again. Applicants are also required to undergo a face-to-face identification check on the day of the OSCE exam. NMC will make final check on the applicant’s registration as well as photograph for their records. This identity check is only done once NMC contacts the applicant. Previously, this tedious process requires nurses to have a 12-month experience of work after qualifying before being able to apply to work in the UK. However, NMC have removed this step so that applicants can apply to join the register immediately after qualifying. Achieving the required score of NMC in one of their English language tests. An applicant must reach the required score for each of the four skills: reading, writing, listening and speaking. A recent pre-registration qualification which was taught and examined in English. Registration and practice of at least one year in a country where the English language is the first and native language. All applicants are subject to these stringent tests in order to ensure a competent nurse or midwife in the UK. Additionally, these changes done by the NMC provides a speedier registration time frame for a nurse or a midwife wanting to apply in UK. As NMC removed the 12-month experience, ample time is given for an applicant to better prepare for necessary registration requirements. There are several reasons to work as a nurse in the UK. Take note, UK has some of the world’s leading hospitals and centers that offer great professional development opportunities. It would also be easy to fit in as their language is English. No one has to learn a new language just to be able to adapt! Want to know more about UK’s nursing application? Do you have any concerns or suggestions regarding the process above? Don’t hesitate to reach us!